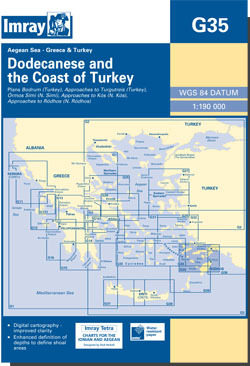 The Dodecanese islands and the adjacent coast of Turkey. Scale: 1 : 190.000. Covers Kalimnos to Rhodes and Bodrum to Marmaris. Larger scale plans of Bodrum, Rhodos, Kos, Marmaris, Simi.